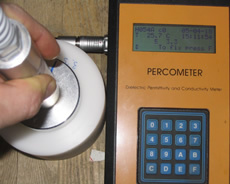 Measurement of soil water content by percometer. Saue, Triin; Kadaja, Jüri; Plakk, Tiit (2008). In: Workshop Program & Papers: 1st Global Workshop on High Resolution Digital Soil Sensing & Mapping, 5-8 veebruar, Sydney. Austraalia: The Australian Centre for Precision Agriculture, 2008, 184 - 192. Measurement of soil water and nutrients by its electrical properties. Jüri Kadaja, Tiit Plakk, Triin Saue, Edvin Nugis, Peeter Viil, Marje Särekanno. In: Acta Agriculturae Scandinavica, Section B - Plant Soil Science, 03 November 2008. Ask for full text!